The FamilySearch status is shown in the toolbar under the header of a person page. In this example, this person hasn't been synced with FamilySearch. There’s something different between the RootsFinder information and the person you matched them with in the FamilySearch trees. Click to compare the two versions side by side. If the person you’re looking at hasn’t been matched with FamilySearch, you’ll see a broken link icon. Click the icon, then click “Match to FamilySearch” to begin the matching process. If none of the FamilySearch profiles match your RootsFinder person, click “NONE MATCH (ADD)” and you’ll be able to create a new person in the FamilySearch trees with your RootsFinder information. Once the person is matched with FamilySearch, you’ll either see a checkmark, which indicates everything is exactly the same, or you’ll see two arrows facing away from each other, which means there’s a difference and you should review the two profiles to see what’s different. 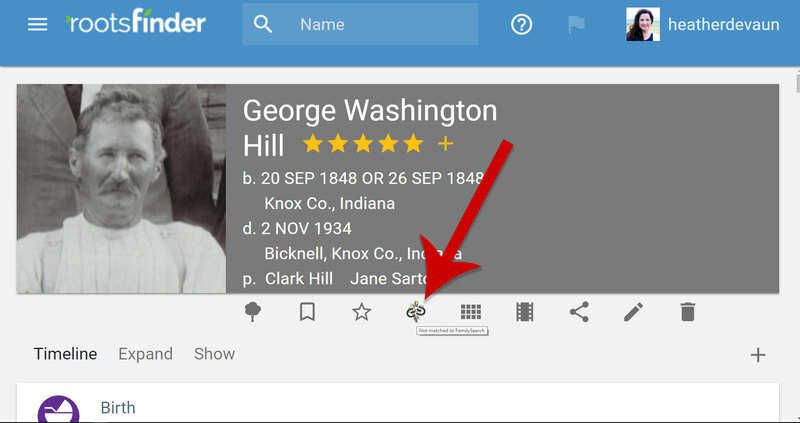 When changes are made to either your RootsFinder person or the FamilySearch profile you’ve matched them with, you’ll see an icon with two arrows facing away from each other. This means you should compare the two and see what’s different. Click the icon to compare the differences between your RootsFinder person and the FamilySearch profile. You’ll see your RootsFinder person’s information on the left side by side with FamilySearch information on the right. If the new information is shown in the person’s header area (birth or death information) you’ll be asked whether you want to update the profile. If you want to replace the existing header information select “Yes, Update profile.” If you want to leave the header information the same as you already have it, select “No, Add Alternate” and the new information will be nested under the other possible facts should you want to change it later. RootsFinder makes it easy to keep your tree in sync with FamilySearch. You can simply copy information back and forth between your RootsFinder person and the corresponding FamilySearch profile. This way you maintain control of your family tree, but also integrate with FamilySearch trees. If you have information in your RootsFinder tree that isn’t at FamilySearch, you can contribute it to FamilySearh by clicking the right arrow (pointing towards the FamilySearch information) and then giving a reason as to why you are adding the information. Sometimes you'll have slightly different information for the same event in your RootsFinder tree and you want to update either RootsFinder or FamilySearch. In this case, you'll see two arrows facing back and forth between RootsFinder on the left and FamilySearch on the right. Click to update your RootsFinder information or contribute to FamilySearch, as you choose. If you click “Add evidence to RootsFinder,” the source will be copied to your RootsFinder tree. Since there’s no event detail to copy in the source (because no event information is stored in source citations) you’ll just be adding a general source citation. However, when you add using the RootsFinder Web Clipper, you’ll be able to add event information into the timeline. When you click “Add Using RootsFinder Web Clipper,” the FamilySearch link will open in a new tab. Use the RootsFinder Web Clipper browser extension for Chrome to easily add all the related event information, including the source citation, to your tree. In this way you’re copying the FamilySearch source but also gathering the event details. If you see something at FamilySearch you would like to bring into your RootsFinder tree, and it's new (you don't have that information in RootsFinder already) click the left arrow (pointing towards your RootsFinder information).